The wood we use, reclaimed from barns, flooring and walls from olde homes, sheds, and stacks, has been exposed to the elements for decades or even centuries. The woods we use are generally aged pine grades. Our wood is picked from outdoor and indoor building sources such as barns, olde houses, sheds and stacks. We space the wood boards with "sticks" between layers to allow for airflow. Most wood has been exposed to the elements for decades or even centuries. Wood that was reclaimed from inside olde homes taken from flooring or walls has likely existed in a very different environment than today's closed-space interiors. We use the boards to create doors to the sizes determined on our visit, but once put together with screws or iron bars, the olde wood might want to bow, shrink, expand or split in some cases. Spaces can develop between boards. To account for these natural processes, some doors are built with backing strips known as board and batten. This uses strips of barn wood, made of the same wood as the door, on the back side of a door, where needed. We determine whether to use this process or to consider other options such as shiplap, where boards fit together with an interlocking "step" that is cut on the edges of each board to hide gaps between them. We don’t recommend painting or even staining very olde wood. It would be a shame to cover up the character and beauty of a 250-year-olde piece of historic pine that comes with a wonderful story. We don't use new wood for our barn doors. Newer wood can warp or crack over time once the door has been assembled and hung in a new environment. The olde wood we use has been naturally dried over time and is stored in a dry enclosed space at our shop. Painting and staining does involve extra steps: A door must be fully assembled so all the pieces fit, then disassembled so that every single piece and every edge can be primed and painted or stained. Then it is put back together when everything is dry. These processes take time and space, as coated boards need to be laid out, and they will require drying time, and take up resources that other work requires for production to continue on pace. We do not recommend painting or staining and tend to avoid projects that require this style. The Barndoorist usually works with steel coated in a rustic black finsh. While some wheel hangers may be similar to those found on the market, they are retrofitted and recoated at our shop during assembly. Bolt heads and lock nuts are the most commonly used pieces and bolt lengths are custom cut for each door width. These are also coated in rustic black in the shop and touched up on site when installing doors. The Barndoorist uses bracket parts for some projects and fashions his own hand-made custom brackets for many door systems. Some are made from 1/4" thick steel and some are even more robust, using 3/8" thick steel. The Barndoorist often uses a metal bender, metal saw and sometimes a large hammer to shape some pieces. Other pieces may need to be sent out. Rails can be ordered and retrofitted to match our style, or can be fashioned from US steel stock in our shop. Spacers and stoppers can often be fully customized depending on job needs. Handles such as the rail road spike are drilled and colored black accordingly. 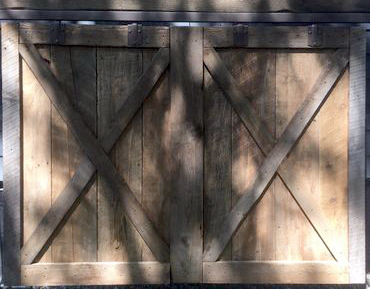 Northshore Barn Doors prides itself on both making many of its own custom parts for doors and also retrofitting any part that may have been found on the market for use in a door project. We do not just buy and resell kit parts, rather, we rework pieces that make the hand-made rustic look come alive and fit perfectly into your home, retail or office space. Here are pictures of some of the wheel hangers used on our doors and some handles we offer with all projects. Other handles and parts can be used and this is discussed when we meet and in subsequent communications during project planning. 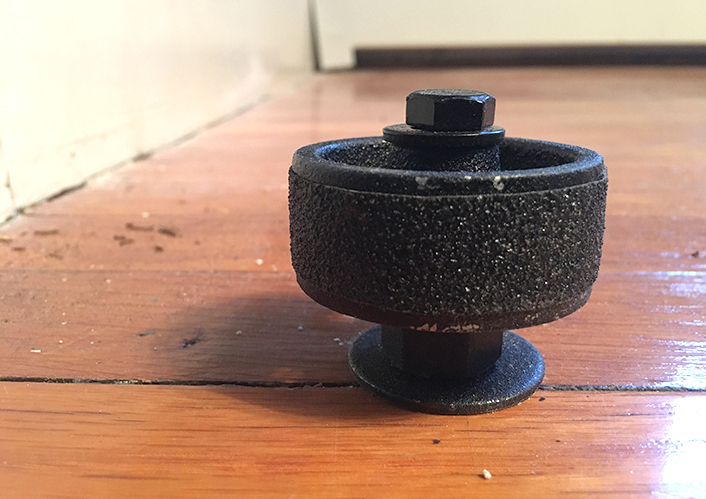 Some wheel hangers may seem familiar, but note that we re-coat the black surface, and we use our own bolts and more secure lock nuts than ones sold online or in store-bought kits. 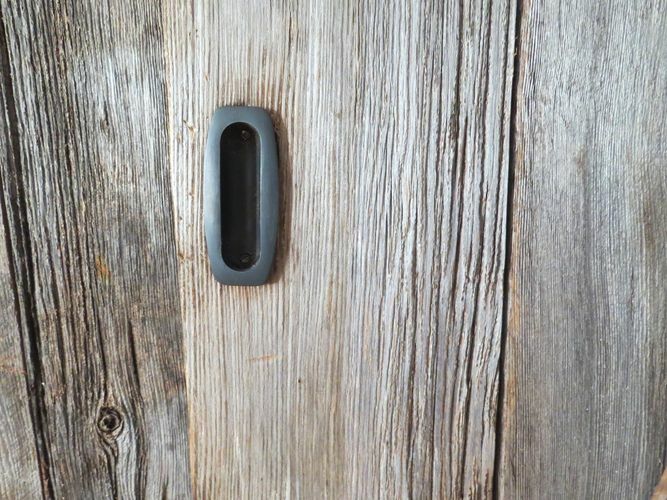 Everything is made black using rustic coatings and sometimes new holes are bored in parts such as rails, brackets and wheel hangers in order to accommodate for larger, heavier and thicker doors. The Barndoorist creates and retrofits hardware, usually done in a rustic black metal finish, and customizes parts for each project. Pictured here are just some examples of the specialized parts you might choose from.